It can be quite difficult to find brown boots in a style that's more urban and less cowboy or rugged. I think I found something: these Bottega Veneta Intrecciato Knee Boot come in dark brown and have exactly the shape and style I like in my boots (I live in dresses and rarely, if ever, wear jeans). A 16" shaft (I'm assuming they talk about length and not circumference) also promises not to be too tall for the vertically challenged . 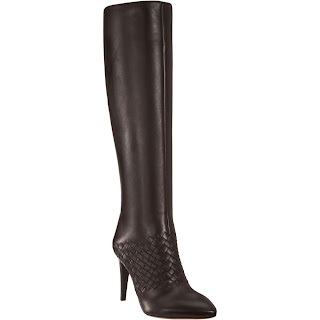 Bottega Veneta Intrecciato Knee Boot ($995) available at Barnyes. OMG OMG OMG OMG. Those are incredible. Ah, another item you've posted that I'm now lemming! You have excellent taste in boots! It's so hard to find a pair of knee highs that are well made and pair well with a classy outfit. I wish more designers would get it through their heads that we want to look put together, not like sloppy teeny boppers. I have a pair of intrecciato loafers in a (slightly) lighter colour and they're the most comfortable shoes i own; they look nice with almost any pants and make my feet happy. Bah, you and your psychic posts! You seem to know all the lines that one can gaze at from afar but not indulge in. Have you any thoughts on their perfume? Those boots are stunning.